February 26, 2010 - Susan Larson, President of The Ninety-Nines, has committed to flying women who have never flown in both her Cessna 182 and Hughes 500 helicopter during the week of March 6-12 in celebration of 100 years of licensed women pilots. "I can’t imagine a more satisfying reason to go fly, not that we really need one," said Larson. On March 8, 1910, Raymonde de Laroche, a French balloonist, became the first woman ever to earn a pilot's license. One century later, the ranks of women pilots continues to grow, but women represent only 6% of all licensed pilots in most countries. As this first-century milestone is reached, a group of modern women pilots is taking steps to make sure the second century is off to a flying start. 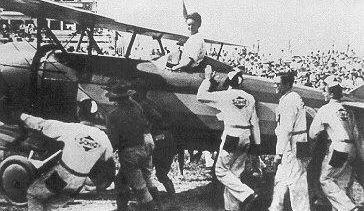 Louise Thaden being congratulated for her first place finish in the 1929 Women's Air Derby. Mirielle Goyer, an Airline Transport Pilot in Vancouver, British Columbia, Canada, has created Centennial of Women Pilots which seeks to have women pilots fly women non-pilots during the week of March 6-12 in honor of de Laroche with the express goal of introducing women to the world of flight. Women pilots from four continents and over 10 countries have registered to participate in the attempt to set a worldwide flying record: the most women pilots introducing a woman to flying in one single day, March 8, as well as within one single week, from March 6 to March 12. To participate, women pilots must hold a pilot's license, be current, fly an aircraft certified for the carriage of passengers, and register free of charge at www.CentennialOfWomenPilots.com to be counted in the official tally. The French Section 99s was the first 99s group to register in support of this record-setting attempt. Larson encourages all 99s and other women pilots to participate in the world record attempt. “Our founding members, many of them record holders, knew the importance of women supporting women. We honor them by continuing to introduce more women to aviation,” Larson added. The 99s was founded in 1929 in Long Island, New York with 99 members. It has grown to include over 5,000 members in 35 countries. Membership is open to any woman who holds a pilot certificate of student or higher. The organization sponsors the Amelia Earhart Memorial Scholarship program, an e-network designed specifically for professional pilots, another for student pilots, and a successful mentoring program. For more information on The 99s or to download an application for membership, visit www.ninety-nines.org or email PR@ninety-nines.org.